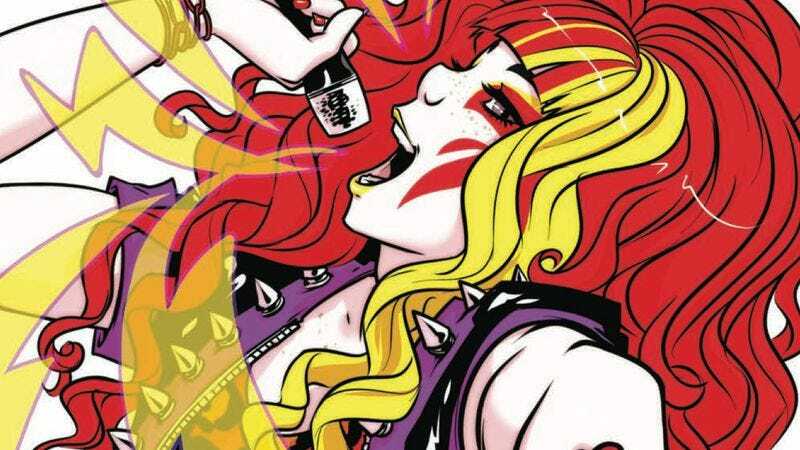 IDW’s Jem And The Holograms has established itself as one of the strongest licensed comics on stands over the past year, reinvigorating its ’80s cartoon source material with fun, character-based stories and bright artwork overflowing with style and personality. (For a more in-depth look at Jem And The Holograms’ success, check out last month’s Big Issues on the series.) Writer Kelly Thompson, main artist/co-plotter Sophie Campbell, and colorist M. Victoria Robado are doing exceptional work with both the Holograms and their main musical rival, The Misfits, and the current “Dark Jem” arc takes the titular group in a dramatic new direction as it gets a severe, sinister makeover, both in terms of appearance and personality. These preview pages from this week’s Jem And The Holograms #12 are a striking example of this book’s strengths, beginning with Campbell’s bold character designs, which give the opening scene introducing the new Dark Holograms intense dramatic impact. Robado’s colors change with the Holograms’ entrance, and her palette is muted in the first scene to reflect the dour personalities that now define Jem and her friends. When the action jumps over to The Misfits rehearsing for their upcoming tour with a new lead singer, the colors become more vibrant and varied, highlighting the contrast between the two groups. These smart artistic choices enhance Thompson’s scripts, adding visual flair to stories focused on personal relationships and the ways they change when fame takes hold.